Most businesses are on a tight budget, especially when it comes to online marketing. Times are hard and many companies don’t have a lot of money to invest on advertising and marketing. The irony is, not marketing your business will have a detrimental effect on your business. One local business owner called Tom who owns a fireplace store has just put a closing down sign in his shop window because nobody is visiting his store and he says he can’t afford to advertise any more. As a result, search results are becoming much more local and personalised and companies who claim their Google Plus Local Page and optimise it properly get the best rewards. The secret is to get your customer to talk about your product or service, how they used it, and the results that they got. Most customers will be happy to do this if you ask them. You could also provide feedback forms on your website. Online customers are used to and conditioned to leaving reviews. They are a great way to get more people interested in what you have to offer. No matter what kind of business you are in, you can get a lot more business by writing a free Beginners Guide. It is an excellent marketing technique. They are an excellent way to get a lot of traffic to your site and increase the interest in your product or service. Networking events are a great place to find new clients and all businesses should make it a practice to attend networking events if possible. These are generally arranged by The Chamber of Commerce or global organisations such as BNI (Business Networking International) or Meetups. A quick search online will reveal a number of networking events in your area. Most, if not all will say yes, especially if you return the favour. 11. Provide exceptionally good customer service. Most people think of PR coming from major media outlets such as radio and television. While this would be fantastic, it is not easy to get that sort of attention. However, there are easier ways to get PR online which can be just as effective, especially if you have a targeted customer group. Getting the attention of blog owners is one way of doing this, especially if it is popular and attracts the sort of readers that you want to target. Here is the plan: Offer a free downloadable report, or set up an exclusive password protected VIP Loyalty Group on your website or Facebook page where you will have special offers and discounts not available to anybody else. People can get access to the report or VIP area by Tweeting about your product or service. Once they have sent the Tweet, they notify you and you give them access to their prize. This is an incredibly powerful way to not only spread the word about your company and website but also to build your online mailing list (if you are giving them the report) or group of followers on Twitter and Facebook. This means that you can keep in touch with these people and build a relationship with them. It will be good for your branding and internet presence. As a variation, you can do this by asking for ‘Likes’ on Facebook or any other social site. If just 10 people do this per day and they each have a following of 100 friends and family, you can see how quickly the word will spread about your business. 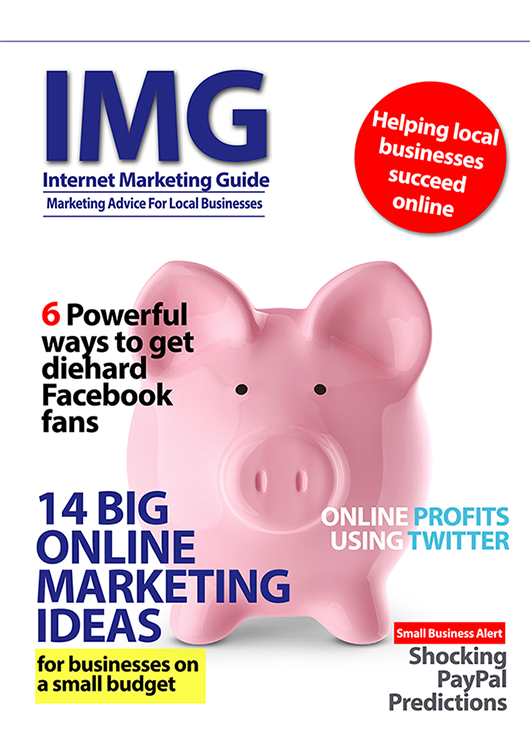 If you are inspired by any of the powerful marketing tips in this article and want to know more about setting them in place, you can find our contact details on page 3 of this magazine and we can do this for you. Brian O’Grady is the founder and director of Flarecom Digital Marketing Sydney. Flarecom is a search engine marketing agency based in Sydney’s inner west. We offer a range of Internet marketing, Pay per click (PPC) & SEO consulting services to ensure long-term success for your business.